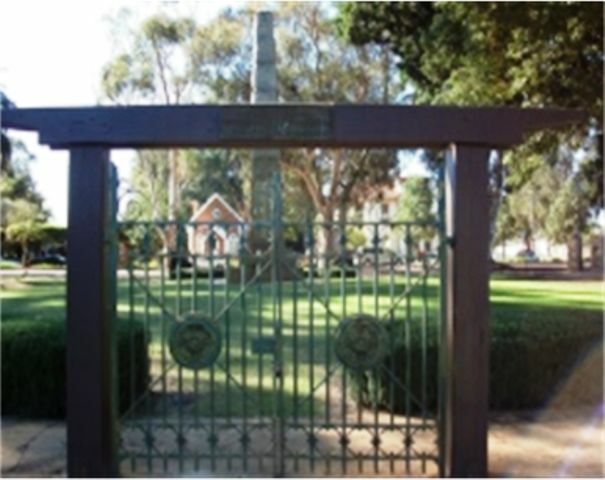 Gates erected by the Municipality of Guildford commemorate the gunners and cavalrymen who trained at Guildford Camp during World War One. The Daily News (Perth), 13th August 1932. "Gunners Day" had its original inception in 1929 and commemorated ex-gunners and Lighthorsemen of Western Australian who trained at Guildford during World War One. The day featured a parade which marched to St Matthew`s Church, Guildford where a memorial service was conducted. The parade is still held annually. To commemorate the raising and training at Guildford of the 10th Light Horse Reg., 8th Battery of A.I.F. Artillery Units. Unveiled by Brig. Gen. A. J. Bessell-Browne C.B., C. M. G., D.S.O, V.D. on the 14th Aug. 1932.